Have you ever tried making homemade guacamole? I just tried it and wow, is it good! It’s the perfect picnic dip recipe! Summer is about outdoors, parties, picnics and get-togethers. With my harsh Canadian winter, I try to make up for the 6 months of cold by embracing the outdoors. This means that I spend less time cooking in my kitchen and more time enjoying nice weather with the family. We try to go on picnics on a regular basis. The best thing about picnics? The picnic foods! One of my favorite things to eat during our picnic trips is veggies, crackers and dips. It is so easy to toss some veggie in a reusable container. My kids help me with this. They like cucumbers, carrots and celery. I take care of the dip. I prefer homemade dips, as they are healthier, easy to make and budget friendly. I made the following picnic dip recipe in less than 5 minutes. I discovered goat cheese during my last shopping at Costco. A lady was hosting a sampling event and really enjoyed it. I bought the pack but then wondered how I could incorporate it in my meals. Since I had an avocado on hand, I thought it will be a great addition to a homemade guacamole recipe. I like my homemade guacamole simple and with just a few ingredients. Some people like garlic in it but I am not fan of it. You can add it if you want. In a bowl, mix all the ingredients above and enjoy with your favorite crackers or as a dip to your veggies. That’s it! If you happen to have any of this delicious picnic dip left over, make sure you store it in a tightly sealed container to keep it fresh longer. Related: Rock Your Family & Friends Summer Picnic Event for Less than $100! Every great picnic needs refreshing beverages to go along with the yummy foods, right? 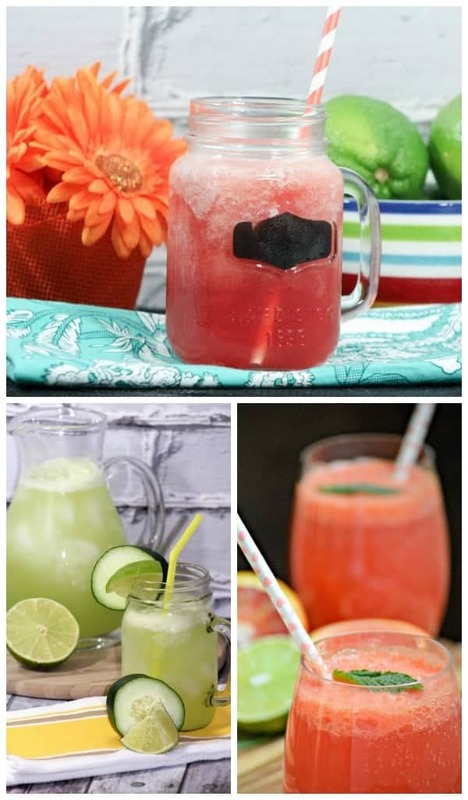 We suggest our yummy lime water recipes! With three different fruity flavors, they’re definite crowd pleasers! If you have left over avocados and are planning to do a little grilling, check out our grilled avocado recipe, it’s perfect for your vegetarian friends! Enjoy your picnic! What is your favorite summer picnic dip recipe? Have you ever made your own homemade guacamole? Share in the comments! Sounds delicious – I eat avocado nearly everyday. I love the simplicity. I love guacamole, but never paired it with goat cheese, so definitely need to try it. Thx so much for sharing this recipe! I have never made it…actually I don’t really care for it. But my husband is crazy about it and I feel bad about not giving him the real thing now and then. I should think the addition of goat cheese to this really makes it “wow”! I’ll be sure to make it for him! I have never tried guacamole but it sounds like a great recipe. Might be time to give it a try! I have never made guacamole myself. Thanks for sharing the recipe! Will be trying it as I know the family would love it and great dip for the summer! Homemade Guac is amazing. I eat avocados with almost every meal and last night we made guacamole with smoked salmon it was so good. I love trying new guacamole recipes because everyone makes it differently so I am definitely going to be trying this recipe. I wish I liked goat cheese I just can’t eat lol but all my friends they love it. Down in Texas we love our guacamole too! But we usually add a little bit of onion and tomato and cilantro. It’s a spicier dip down here. I just bought some avocados and now I’m craving guacamole, this sounds like a quick, easy and tasty recipe. I might have to try it with feta! I have made my own guacamole but it did not taste as good as the ones I have bought. I have not always been a huge fan of goat cheese but this dip looks super delicious. I will have to give it a try. This looks amazing, goat cheese is so good and I can imagine how it tastes with guac. I have a dip I make for picnics and barbecues that has cream cheese, swiss and bacon in it. So yummy! I make homemade guacamole at least 2x a month..the family loves it! I’ve made quite a few variations however, I’ve never added cheese to it! Its a big deal for me again, i love Guacamole, but goat cheese I never tried to mix it in a dip.. looks yummy.!! thanks for your recipe, I try it.. I loev to make Guacamole at home!! I have never tried it with Goat Cheese it looks amazing! This looks like an amazing recipe. Need to test this out for my next party. Everyone loves guac and goat cheese. I can eat guacamole all day long, but have never acquired a taste for goat cheese :/ The drinks you added look delicious! This looks and sounds delicious! Actually I have never eaten guacamole, but I would love to try this one. 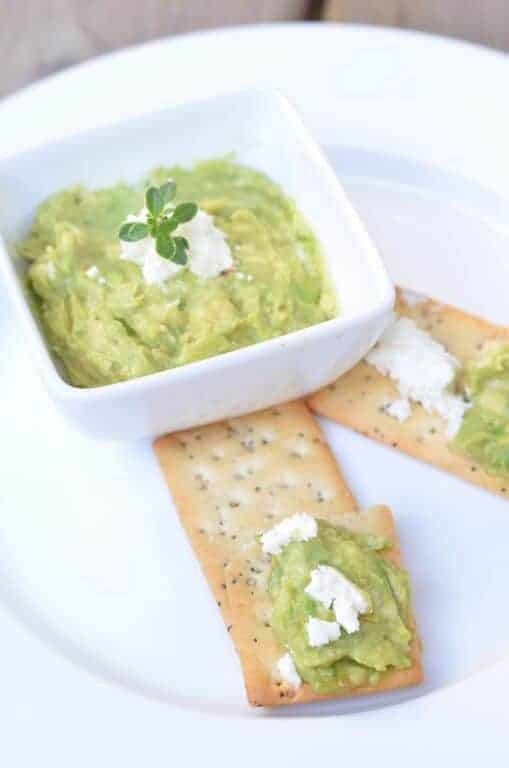 We eat guacamole all the time but never thought of using goat cheese! Hubby makes a dip with cream cheese and salsa with the avocado and we love it! I love both of these ingredients and would have never thought to combine! This is now on my list to do! Your cuacamole makes me crave of avocado right now. I haven’t tried making guacamole and this sounds really good. I haven’t tried making homemade guacamole, but.. now that I have seen your recipe, I want to try it. This looks so enticing especially for summer. I have never made my own but I would be willing to try. My special dip is my own special version of a spinach dip that my family loves. That would be the hit of any picnic!! I think it sounds amazing and I can not wait to try this. Your guacamole looks so smooth and creamy! Mine always comes and lumpy and really unappetizing. I love that you put the delicious drinks with it, too! 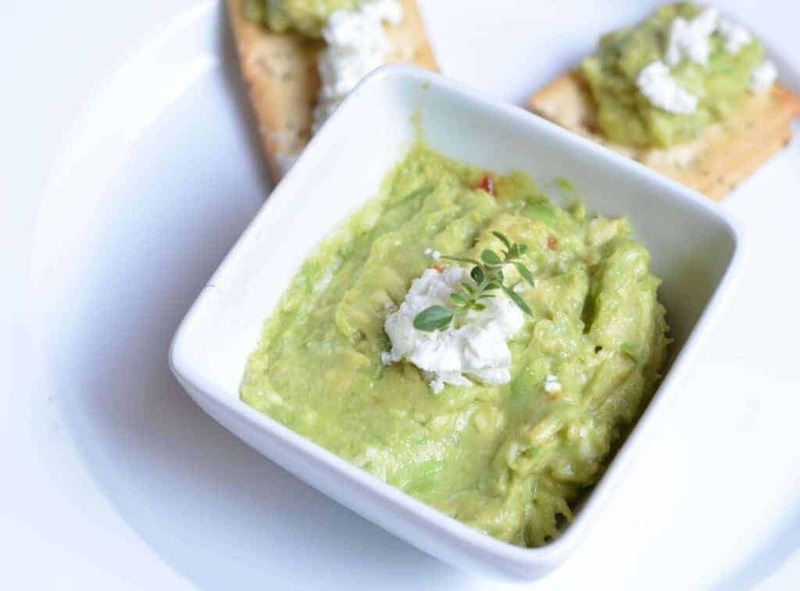 Two of my favorite foods….guacamole and goat cheese. It would be devoured!